I recently attended a Stop & Shop event held at the beautiful Aquagrill in New York City, the kind of place that makes you think wow, I want to own a restaurant, why don't I own a restaurant? One of these days people are going to discover that I consider takeout (for the kids) and Lean Cuisines (for us) "making dinner" and quit inviting me to these things, but it sure is inspiring to see other people cooking. Consumer Advisor Andrea Astrachan told us about Stop & Shop's policy of buying only local produce as chef/owner Jeremy Marshall whipped up gnocchi with President Feta Cheese and and a Sorrento Ricotta Cheese Sorbet. Then they handed out recipe cards and these little cones floored me, which shows you my level of cooking sophistication. They're made with ricotta cheese so they're a healthy dessert for kids, only they won't know it and sure, maybe someday they will require therapy for that but for now, if you're looking to get healthy foods into your kids in whatever way possible, they are genius. I leave you with the recipe, as a parting gift, because we are off to a beach vacation for the week. But I am not abandoning you completely, I have a few great guest bloggers lined up and Justin Bieber might stop by here, too, you never know, or maybe President Obama or someone like that. Using a wooden spoon, mix ricotta, sugar, vanilla and orange rind until smooth. Add chips and stir until evenly blended. Cover and refrigerate for 1 hour. 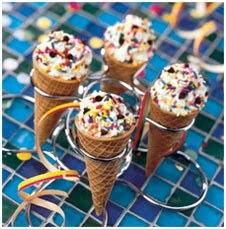 Spoon mixture into ice cream cones. Add sprinkles and serve. If the kids say, "These don't taste like ice-cream" or wrinkle up their noses you can say "I don't know what you mean," thereby guaranteeing they will need therapy later in life, but at least their bones will be full of calcium. doesnt ice cream have calcium? Giving me that feeling of wishing I am not lactose intolerant. Sigh. Hi, Cheryl. Ice-cream has calcium, but cheese is a richer source of it and ricotta cheese happens to be packed with the stuff. Barbara, I'm sorry! Can you pop pills and do dairy? I have a bad case of insomnia tonight, but at least I'm the the poison ivy has subsided, got myself some prednisone and a prescription gel. I would have kissed the dermatologist except Dave came to the appointment with me. Wash those sheets and all the clothes you have been wearing, just to be sure you got rid of all the poison ivy oil! oooh those sound very yummy. I think I'll try those! YUMMY! I am definitely going to make those! Great idea! YUM. That looks so good! I Fell in love with canoli's when I was in Boston. This looks like something I could easily remake at home!